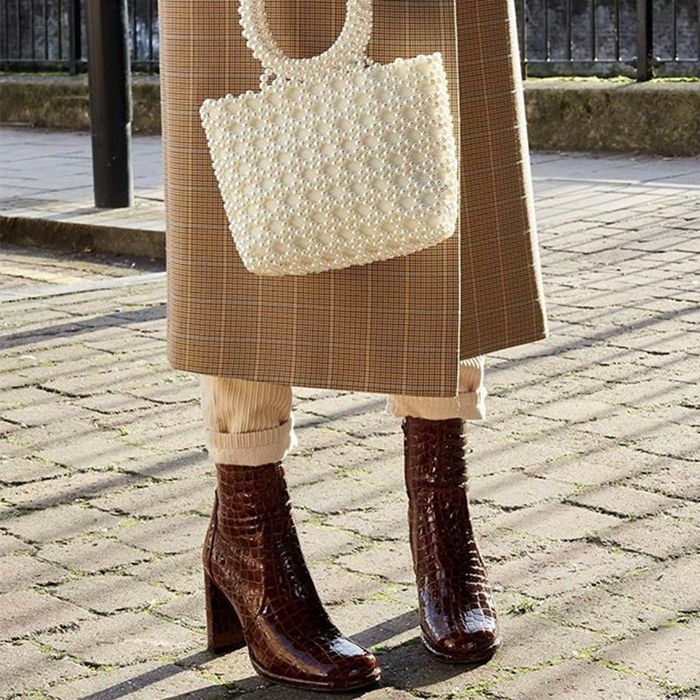 When we see multiple influencers wearing the same brand, we discover our inner Poirot and piece the clues together to find out where they're all shopping. In the age of Instagram, it's often the case it's a lesser-known brand or a designer we'll most likely have to save up for. But this time around, it's all about the high street, and in particular, Warehouse. There are several Insta stars who are loving the brand (among them, Lucy Williams, Lindsey Holland and Emili Sindlev) and putting their names and faces to their very own edits. They've helped us narrow down the best bits, and we've helped you get all the insider info on the upcoming sales. We're showing you a step-by-step guide on how to shop the sale and 15 best pieces you'll need to be a part of the #WarehouseWornWell gang. Lindsey at @ropesofholland joins the Warehouse Curates party campaign and gives us all the shiny sequin inspo. A long-sleeved number like this velvet sequinned high-neck dress is the perfect way to go mini. Hello, New Year's Eve outfit. Copenhagen-based stylist and influencer Emili Sindlev is the face of the Warehouse Curates Copenhagen collection. The single-breasted brown car coat is a classic to snap up. The one and only Lucy Willams also created an edit for Warehouse earlier in the year, and some of the best bits are still here to shop. Invest in soft knits during the sales and you won't regret it. You'll want all six colours of the ribbed funnel-neck jumper. So what's the key to shopping the Warehouse sale? It's all about knowing what you want, and most importantly, how to get it. So, first things first, there's already a sale online that you can shop right here, right now. We all know Warehouse is the go-to for occasion wear, workwear and party wear, but it's the below pieces that are already selling out, fast, so we consider these the top pieces to bookmark. ■ Know what you really want by adding pieces to your wish list on the website already. ■ Go for more expensive, luxe-looking items like cashmere, leather and wool—they'll go the distance in your wardrobe. If you stick to buying classic pieces, you're less likely to want to return them. ■ The website goes on sale before the store, so sign up to the mailing list when you make an account to get sale previews and chances to shop it before anyone else. ■ Regularly check the sales and offers tab at the top. If your fave pieces aren't in the sale, there might be a promotion you can make use of. ■ You can shop the Warehouse sale by size and store availability. This way you can pinpoint exactly what is available to you and not get FOMO from other must-haves on site. You'll never want to return a simple, chic red dress. This exclusive leather midi will be one of the first pieces to sell out in the sale—trust us. If there's one thing 2018 has taught us, it's that you'll never look back on investing in a teddy coat. Guaranteed to get everyone asking, "Where did you get that from?" Cashmere is always an instant win. You'll wear this all the time. Party bags are something you bring out year after year. The box clutch is here to stay. Say hello to the camel cashmere knit that'll stay in your wardrobe forever more. You'll likely underestimate the number of times you've relied on a sequinned showstopper. A black blazer can overhaul any outfit—from jeans and a tee to a dreamy winter dress. You'll end up layering a printed polo under everything this winter. These are super affordable and chic. Warehouse now does pj's, and they're more than appropriate for the store. Look out for the matching trousers, eye mask and wash bag, too. They're the 24/7 trousers that'll take you from work to drinks. Next up, here are the best ways to shop the Zara sale before anyone else.